Editorials on what constitutes a strong journal article repeatedly stress the importance of theory in addition to rigor and relevance. While one does not build theory from scratch, there are different ways to approach theory building. Day 1 of this workshop explores what theory is and what it is not, the types of theories, and the different stages of the theory building process. We will also introduce you to a range of software tools that can support the initial theorizing and research question development process. Furthermore, we look at different ways to operationalize initial concepts. Day 2 and 3 of this workshop look at Partial least squares structural equation modelling (PLS-SEM), which has recently received considerable attention in a variety of disciplines, including marketing (Hair et al 2011, according to Google scholar the most-cited article ever published in JMTP; Hair et al. 2012a, according to Google scholar the most-cited JAMS article since 2012), strategic management (Hair et al. 2012a, according to Google scholar the most-cited LRP article since 2012), and management information systems (Ringle et al. 2012, according to Google scholar the second-most cited MIS Quarterly article since 2012). The goal of PLS-SEM is the explanation of variances (prediction-oriented character of the methodology) rather than explaining covariances (theory testing via covariance-based SEM). The application of the PLS-SEM method is of particular interest if the premises of covariance-based SEM are violated and the assumed relations of cause-and-effect are not sufficiently explored. An additional advantage of the PLS-SEM method is the unrestricted incorporation of latent variables in the path model that either draws on reflective or formative measurements models. Introduction to state-of-the-art of PLS-SEM using the SmartPLS 3 software: Foundations of PLS-SEM and how to apply it by means of the SmartPLS 3 software. This course has been designed for full-time faculty and PhD students who are interested in learning how to step-up their research towards well-designed and publishable outputs that potentially survive the test of time and are read and cited. A basic knowledge of univariate and multivariate statistics and SEM techniques is helpful, but not required. All participants get a certificate of attendance! Most universities acknowledge the course participation with an equivalent of 6 ECTS. This workshop is designed to look at the stages of research question development and theorizing together with the subsequent methodological implementation using the multivariate analysis method PLS-SEM in international business and management research. The learning objectives are to (1) contribute to theory by usefully developing novel concepts and operationalisations, (2) have an in-depth methodological appreciation of the PLS-SEM approach (the nature of causal modelling, analytical objectives, some statistics), (3) being able to evaluate measurement results, and (4) understand complementary analytical techniques. Research question development and theorizing using creativity enhancing tools such as Vosviewer and NVivo. In addition, the participants will be able to use the SmartPLS 3 software (www.smartpls.com) for their PLS-SEM analyses. Lectures/Presentations: The sessions will cover theory and its application. All participants receive PDF files of the presentations. using Vosviewer, Nvivo and Endnote: Specifically, systematical harvesting academic literature for critical review and theoretically grounded idea and concept/item development. using the latest SmartPLS 3 version: Specifically, theoretical explanations underlying the software procedures and practical exercises where participants will apply their learning to real-world examples provided by the instructors. All participants get a 60 days license of the SmartPLS 3 Professional software. Hair, J.F., Hult, G.T.M., Ringle, C. M., and Sarstedt, M. 2016. 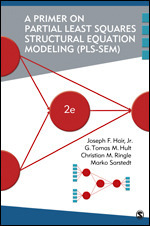 A Primer on Partial Least Squares Structural Equation Modeling (PLS-SEM). 2nd edition. Thousand Oaks, CA: Sage. Hair, J. F., Sarstedt, M., Ringle, C. M., and Gudergan, S. P. 2018. Advanced Issues in Partial Least Squares Structural Equation Modeling (PLS-SEM). Thousand Oaks, CA: Sage. Alvesson, M. and Kärreman, D. (2007). Constructing Mystery: Empirical Matters in Theory Development. Academy of Management Review, 32(4), 1265-1281. Hair, J. F., Ringle, C. M., and Sarstedt, M. (2011). PLS-SEM: Indeed a Silver Bullet. Journal of Marketing Theory and Practice, 19(2), 139-151. Hair, J. F., Sarstedt, M., Pieper, T. M., and Ringle, C. M. (2012). The Use of Partial Least Squares Structural Equation Modeling in Strategic Management Research: A Review of Past Practices and Recommendations for Future Applications. Long Range Planning, 45(5-6), 320-340. Hair, J. F., Sarstedt, M., Ringle, C. M., and Mena, J. A. (2012). An Assessment of the Use of Partial Least Squares Structural Equation Modeling in Marketing Research. Journal of the Academy of Marketing Science, 40(3), 414-433. Henseler, J., Ringle, C. M., and Sinkovics, R. R. (2009). The Use of Partial Least Squares Path Modeling in International Marketing. In R. R. Sinkovics and P. N. Ghauri (Eds. ), Advances in International Marketing, Vol. 20: 277-320. Bingley: Emerald. Richter, N. F., Sinkovics, R. R., Ringle, C. M., and Schlägel, C. (2016). A Critical Look at the Use of SEM in International Business Research. International Marketing Review, 33(3): 376-404. Ringle, C. M., Sarstedt, M., and Straub, D. W. (2012). A Critical Look at the Use of PLS-SEM in MIS Quarterly. MIS Quarterly, 36(1), iii–xiv. Sarstedt, M., Hair, J. F., Ringle, C. M., Thiele, K. O., and Gudergan, S. P. (2016). Estimation Issues with PLS and CBSEM: Where the Bias Lies! Journal of Business Research, 69(10), 3998-4010. Sarstedt, M., Ringle, C. M. and Hair, J. F. (2018): Partial Least Squares Structural Equation Modeling. In: C. Homburg, M. Klarmann, and A. Vomberg (Eds. ), Handbook of Market Research. Heidelberg: Springer. Sinkovics, N. (2017). Pattern Matching in Qualitative Analysis. In: C. Cassell, A. L. Cunliffe, and G. Grandy (Eds. ), The Sage Handbook of Qualitative Business and Management Research Methods. London: Sage. Sinkovics, N. (2016). Enhancing the Foundations for Theorising Through Bibliometric Mapping. International Marketing Review, 33(3), 327-350.